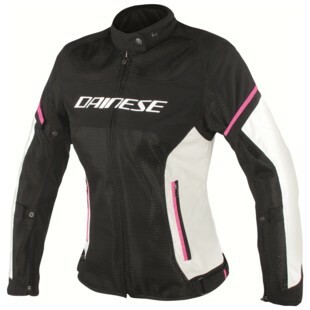 New this Spring from Dainese is the Dainese Air-Frame D1 Women's Jacket. The Dainese Air Frame D1 Women’s Jacket incorporates all the necessary features for a performance summer riding jacket, but with the fit and finish that only Dainese can provide. hing succinctly and precisely than it is to throw a ton of extraneous fluff on your original idea and then call it a day. Such thought was at the forefront of the newly redesigned Air-Frame D1 from Dainese. Large areas of mesh incorporated within the QuickDry Fabric chassis provide maximum airflow when the weather gets unbearable. Composite protectors are standard in the sleeves and there is a pocket for an optional back protector as well. A handy windproof liner can be installed for those chilly morning rides and removed quickly when you know the day is going to heat up. Thoughtful attention to detail such as the Anti-Floating Sleeve System and soft inserts at the wrists and neck where the jacket comes into contact with the rider’s skin reflect Dainese’s experience and expertise, attesting to the quality and value of the Dainese Air Frame D1 Women’s Jacket.